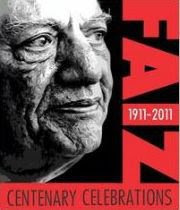 Faiz Ahmed Faiz (1911-1984) was one of Pakistan's leading and internationally recognised poets. His admirers are celebrating his centennial birthday across the world and a colourful event has been chalked out to pay homage to the great poet and humanist in a befitting manner. Guests include Zia Mohyeddin, Javed Akhtar, Salman Alvi, Tariq Ali and Faiz's daughters: Moneeza and Salima Hashmi. The event will end with a performance by Laal, a Pakistani band. Children under 10 years are allowed free entry but their places must be reserved. A children’s corner is being arranged "taakay bachchay tang na karein".